Along the way, things took a turn for the worse. Shackleton’s ship, The Endurance, was surrounded by ice. He and his crew jumped aboard their lifeboats, eventually landing on Elephant Island. However, with no help on the way, the legendary explorer and a select few men were forced to continue on for 800 miles, to eventually land on South Georgia Island. From there, 20 miles of glaciers and mountains awaited. After a 36-hour struggle, Shackleton and two others reached their destination on the other side of the island: the Grytviken whaling station. Here is what makes Shackleton a true hero: he didn’t forget about those he left behind on Elephant Island. Instead, he returned to rescue them. The harrowing tale of Sir Ernest's Shackleton's fateful trans-Antarctic expedition will live on in history through books, films and even a graphic novel about his explorations. However, each year, a select few people partake in a moving and memorable ceremony in South Georgia, to celebrate the life and work of an Antarctic legend. Since the days of Sir Ernest Shackleton, Antarctic exploration has become more accessible. Even so, you cannot visit the incredibly remote and wild Polar Regions without refining your appreciation for exploration as it must have been decades and even centuries ago. As stewards of these regions, Quark is thankful for those who blazed trails for us. "My home for that time, the research base at King Edward Point (KEP), houses 35 people in the summer and 12 in the winter. There are no roads so travel is limited to places accessible by foot or by small boats. There is no television and very limited internet access. Food is delivered once a year with fresh supplies every 10-12 weeks. In the summer there is the occasional night out on a visiting cruise ship and the odd holiday on a type 42 British Navy Destroyer. For residents of KEP the majority of time is spent in Cumberland Bay and the surrounding area." In Shackleton's day, there would be no visiting Antarctic cruise ship, nor were fresh supplies delivered as regularly. Even so, he fell in love with the place. It's a sentiment echoed by nearly all who visit here to this day. In fact, Shackleton so loved South Georgia that after his death, when his body was taken back to South America to be repatriated, his wife insisted it be returned to Grytviken for burial. 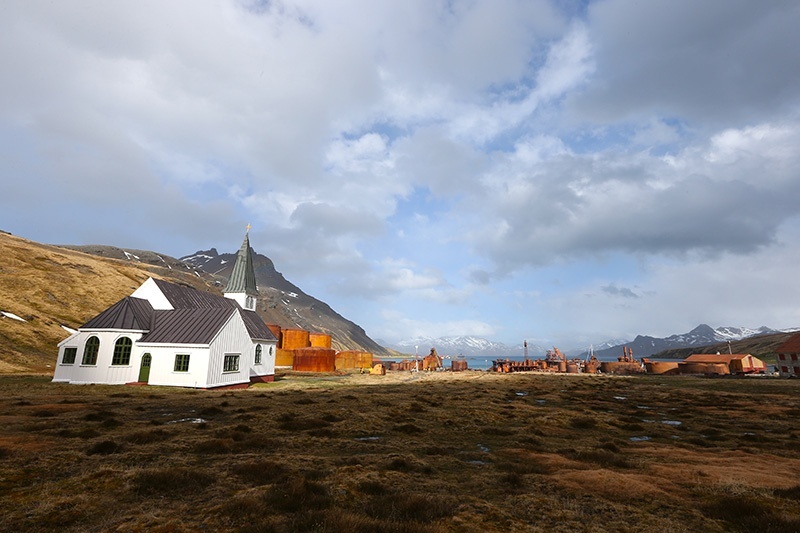 Each time Quark passengers visit the Grytviken Whaling Church, those interested in paying their respects to Shackleton can do so. 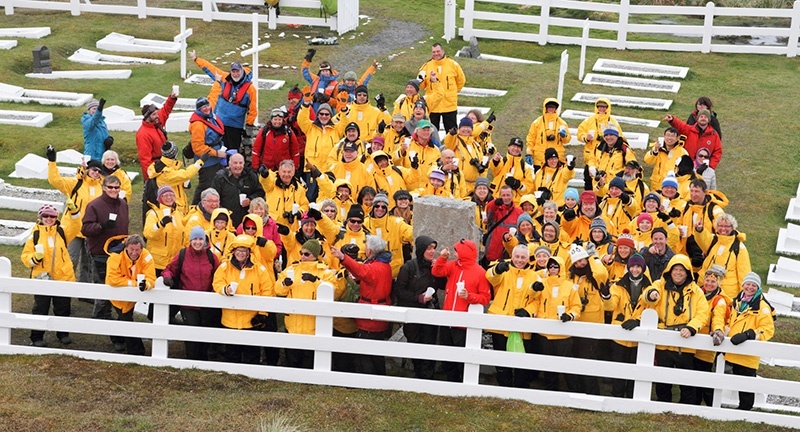 Weather permitting, visitors gather at Shackleton’s grave site for a ceremony, including a short speech and a toast in which passengers and expedition staff raise a glass in his (whiskey and non-alcoholic beverages are available for toasting). We are careful not to disturb the approximately 40 other graves in the cemetery. 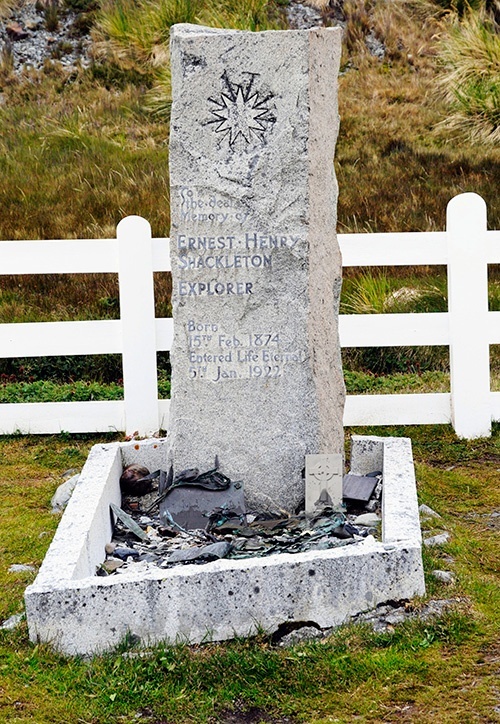 Passengers may be interested in paying their respects to Shackleton's second-in-command, Frank Wild, as well; his ashes were recently returned to Grytviken and buried beside his leader's. "It's an interesting energy of reverence, appreciation and excitement to be in the presence of such a well-known explorer. It's a very significant component of a trip to South Georgia and the Grytviken whaling station." As you stand in the cemetery, he explained, the weather, smells, and sounds provide an emotional connection to South Georgia, as well as to Shackleton and his crew. It is not difficult to identify with what explorers to the area faced more than 100 years ago. 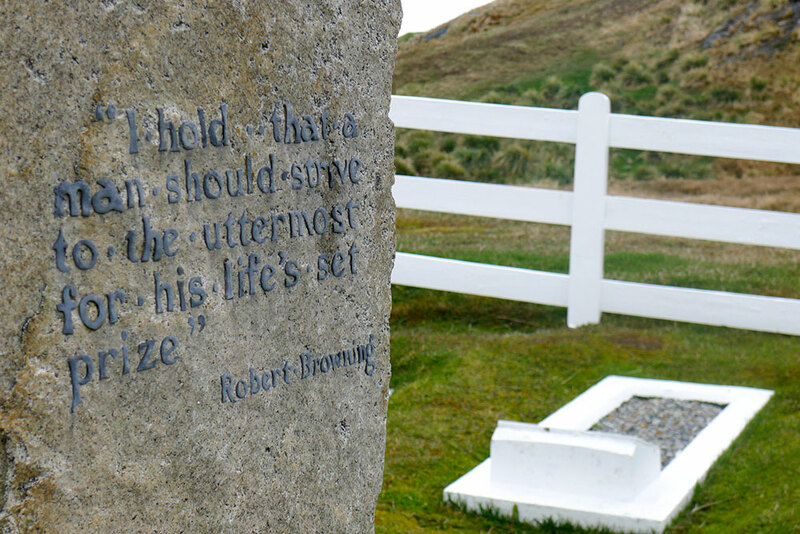 Visiting the grave of Sir Ernest Shackleton on South Georgia is an emotional stop on an enjoyable Antarctic holiday. It is a wonderful experience and one that passengers tell us helps them feel truly connected to the epic history of the places we visit. Quark has named our loyalty program after Sir Ernest Shackleton, a man we consider one of Antarctica’s greatest explorers. Membership is free and the benefits run deep, ranging from savings on future expeditions to a commemorative patch and much more. Find out more about Shackleton Club benefits or enroll today.